One of the biggest blockers to decluttering your home can be just knowing where to begin. We often know that we want to start simplifying, but we just don’t know where to begin. So we don’t do anything. The clutter just stays there. Over the past few years I have slowly been decluttering and simplifying, and while I will never be a minimalist, I can honestly say that there are very few things in our house that are not used or loved (my two criteria for keeping an item). So here are some things I have learnt along the way to help make decluttering simple. Use one tip or all of them. 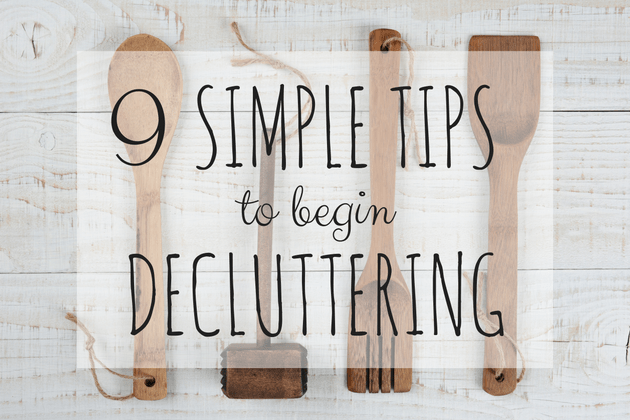 When you are beginning to declutter it can be hard to know where to start. A good place is something easy. Think about getting rid of duplicate items; after all you only need one rolling pin, one iron, one set of gumboots etc. If there are things that you have been meaning to get rid of, start there! Check out this post on how I began to declutter in our home. Decluttering becomes easier with time and practice, so avoid dealing with sentimental objects until you have gone through and decluttered the practical things. 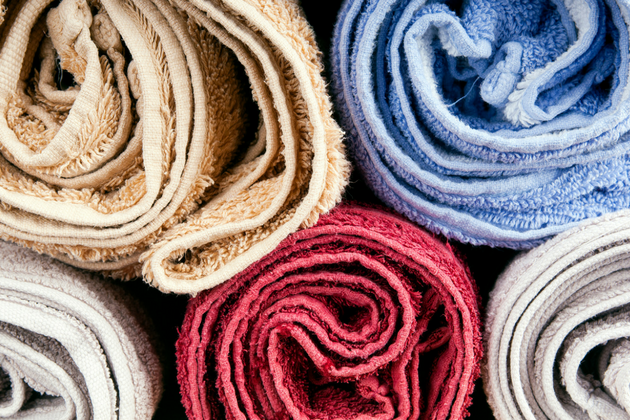 It’s a lot easier to decide what to do with old towels than with a vase that Aunty Prue left you in her will, no matter how ugly the vase is. Start with items like old clothing, kitchen utensils, and cleaning products (which no-one has a sentimental attachment to), and then work through to more sentimental items. Once you have sorted through your belongings, and decided what things you no longer need, you need to get those items out of the house as soon as possible. Having a big pile of things by the front door is dispiriting to say the least. Also little ones seem to have a renewed interest in anything that might look like it is going to go (this is what happens in my house!). With most items I declutter, I either throw in the bin, or I donate them to a local charity shop. If you live close by, try to drop off the items within 24 hours of sorting. Living far from town, we don’t have that option, but I always have a donation box sitting in our spare room so that items we need to giveaway are collected in a central spot ready to be taken to town on our next trip. I rarely try to sell my unwanted things online unless they are worth a lot of money. I think the time and effort of photographing, listing, responding to questions, packaging, and posting items are rarely worth the money that the item makes. Also selling is one more step in getting those items out of the house quickly. When you try to declutter too much at once it can become overwhelming, so try to break down the job into small chunks. This way you can stop when you need to and still feel like you have accomplished something. For example, declutter a shelf of the pantry, or a drawer of the kitchen at a time, rather than trying to do the whole kitchen at once. One of the first things I decluttered was the linen press. To begin with, I did just the sheets. I got rid of all the odd and worn sheets, and left two sets per bed, plus one set for the guest bedroom. Once I had done that, I moved on to towels and so forth. Doing the whole linen press at once was unachievable for me at the time, but item by item I got there! If you love to tick things off a list, write a master list of all the areas you need to declutter and then start ticking them off as you achieve your goal. Be specific. Instead of writing “bedroom”, write “bedside table”, “shoes” etc. There is nothing like checking something off a list to help keep you motivated. If you need to get some serious decluttering done, set aside a regular time, make a list, and get going. I always think the night before the garbage truck comes is a great opportunity with an inbuilt deadline – get that clutter in the bin before it gets collected! If you find it difficulty to keep motivated with the decluttering, ask a friend to keep you accountable. If you have a friend who wants to do the same, keep each other accountable. It might be as simple as “this week I’m going to sort out the spice rack”. Tell your friend your plan, and ask them to check in with you later in the week to see how you go. Once you tell someone your plan, it gives you that extra motivation to keep on going. Often our homes become cluttered because we have no systems for storing similar items, so while you’re culling take the opportunity to put things that are similar into containers to keep them together. For example, when I decluttered under the bathroom sink, I got a few containers and put hair products in one, skin products in another etc. When I did the pantry I popped all the spices and spice mixes into a container so I didn’t have to dig around looking for them. Toys are another thing that really benefit from having a system (check out how we manage toys here, and here). You really don’t need to spend a lot of money to do this. Use ice-cream and yoghurt containers or cut down cereal boxes, or hit up your local dollar store for affordable containers. Include a system for getting rid of things you don’t want or need in your house (we have a donations, and return box that we use). What ever you decide to use, having some kind of system will help prevent clutter building up again. Easier said than done, I know! The clutter only builds up if you continue to bring it into the house. Learning to say no to things you don’t actually need will help you to avoid some clutter coming in, and make decluttering your home so much easier. I’d love to know your tips for decluttering. What things do you struggle with? I’m a new blog reader. Yours is my first so thank you for making it sound doable…as I may, one day, become a blogger. To decluttering. I’m not at a ‘gettingridofthings’ stage in my life, however am rather keen on gettingthingsinorder! There is something undeniably satisfying and beautiful (just as balanced verse) in a well ordered cupboard/ wardrobe/ pantry. The key for me is to do this in such a manner as speaks towards the maintenance of such! 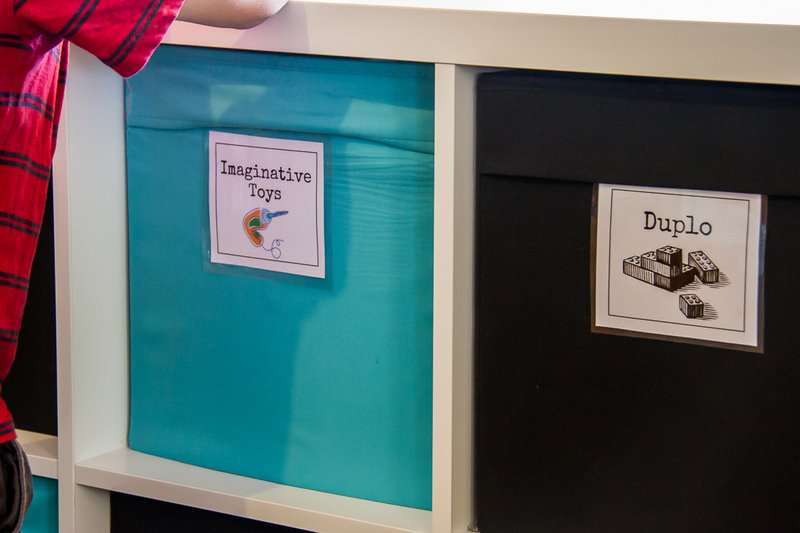 Your suggestions re containers and labelling are super. Thank you….is it the teacher in the wings? Great post! It took my so, so long to begin dealing with sentimental items, but I am getting much better at it. Talking to friends makes me realize how far I’ve come – I would have kept the same things they do five years ago, but now I have a hard time seeing why they’d want to… But I got there by taking baby steps.